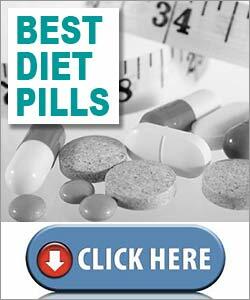 The Gastric Band Pill is a weight loss supplement produced in Britain by Clinico. The company also markets a number of other health and fitness supplements, and some health and beauty products too, but in all cases the big promises that are made for the products are not backed up by an adequate amount of information about how the results are likely to be achieved. The Clinico Gastric Band Pill is not a new product; it’s been available for nearly two decades and Clinico claims to have sold over 16,000 pots of the pills to customers all over the world. That’s a lot of pills, but given the time period involved they could hardly be said to have been flying off the shelves. 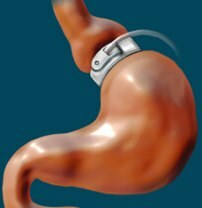 Gastric banding is a type of surgery whereby a piece of apparatus divides the stomach into sections.This creates a small pouch that narrows the opening of the stomach. 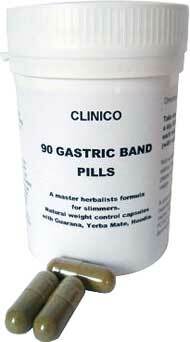 Clinico’s Gastric Band Diet Pill is far removed from the surgical procedure. 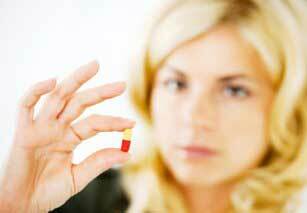 What is the Gastric Band Pill? Clinico market their Gastric Band Pill as an alternative to gastric band surgery. Often chosen as a last resort by people who are desperate to lose weight and have exhausted the other options, gastric band surgery is an unpleasant and potentially dangerous procedure. Patients are cut open and an adjustable band is placed around the stomach and tightened. This compresses the stomach, reducing the inner diameters to create a space that is too small to accommodate anything other than the smallest quantities of food. In its favor gastric band surgery can severely limit the daily intake of calories and will in all probability force the body to start burning off body fat as an alternative source of calories. Going under the knife is not a pleasant experience though, and just because the stomach is unable to accommodate much food does not mean hunger pangs will be banished. The desire for food may (initially) remain, only the ability to fully satisfy that desire will be prohibited. Given the very real negative aspects associated with gastric band surgery, any product that really could restrict the calorie intake to a similar degree, without the need for surgery or living with hunger pangs, is likely to prove popular with many dieters, and Clinico are quick to point out gastric band surgery can cost in excess of £5,000. Their pills are, of course, considerably cheaper, and Clinico try to add a little mystique to their advertising campaign by stating their formula “was used widely in the distant past but has been mostly forgotten by the modern world”. But they admit the formula works by reducing the appetite and boosting the metabolism. That means it probably functions as a combined appetite suppressant and fat burner. That’s hardly a lost art. Most of today’s weight loss formulations are designed to function in exactly the same way. According to Clinico their Gastric Band Pill contains “a long established ground-breaking herbal remedy for sustained weight loss” that sets the standard by which all competing products should be judged, but the official website fails to state a single ingredient or supply any evidence to back up any of the claims made for the product’s abilities. Without any idea of the contents of the product, how is anyone expected to know what its potential is likely to be? If Clinico are aware of any side effects they fail to share this on their website. They do, however, issue a warning stating supplementation must be discontinued if rapid weight loss is experienced, but this is probably a thinly disguised sales tactic designed to hook-in buyers who are looking for a weight loss product that can deliver fast results. If the lack of inclusion rates is a concern when trying to ascertain the possible benefits use of the capsules may provide, it is doubly worrying when trying to judge the possibility of negative issues. Some ingredients—even natural ingredients—have the capability to present dangerous side effects. Nobody should be expected to purchases any form of supplement without knowing the ingredients used and the risks involved. So, from a consumer’s point of view the safest option is stay well clear. The Clinico website provides a few testimonials that make the pills sound like the greatest thing since sliced bread, but testimonials that appear at the bottom of a sales page are never to be relied upon. Independent reviews would be more believable, but none could be found. Clinico Gastric Band Pill can only be purchased from the Clinico website and a bottle of 90 capsules carries a price tag of £29.50 (pricing correct at the time of this review). It is also possible to purchase larger sizes (180 capsules / 270 capsules) and customers who choose to purchase bigger bottles can make modest savings. As a further incentive to make a snap-decision to buy, site visitors are offered a free mental-programming weight loss CD and a complimentary bottle of one of Clinico’s other products. The offer is supposedly good for “one day only”, but the incentive is an everyday occurrence and has been so now for a number of years. As for a guarantee, one is offered, but its duration is not specified. Clinico merely state that customers who “give the Gastric Band Pill a trial for a week or so” and are not happy with the results will be awarded a no quibble refund. Its hard to recommend Clinico’s product in light of the products that are currently in circulation. We have complied a list of best slimming tablets based on several contributing factors that not only include efficacy bit, value for money and safety.